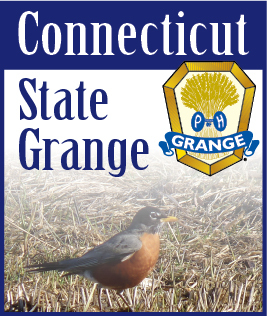 The 133rd Session of the Connecticut State Grange is behind us now. The changes to the schedule were an improvement in the attendance and participation, but we are still running short on the number of Granges attending and non-delegates sitting on the sidelines to see what goes on at State Session. Our National Representatives Claire and Steve Logan were well received and I thank them for accepting the invitation to visit with us. I congratulate all the Granges and members who won awards. Your hard work pays off in the end. There weren’t as many entries in the Honor Grange Program. And the Pomona Honor Grange was close to the end with Mountain County Pomona #4 taking first place. This year we only had 14 resolutions for the committees to work on and we had a final count of 17 resolutions (with substitutes and committee resolutions added in). The Celebration Banquet was well attended and entertainment had us all singing and shaking. Thanks to Marge Bernhardt for a job well done. I wish to thank the CWA for the centerpieces ad gifts at the Session. I thank the Junior and Youth Committees for the work that they did during this past year. I hear the Junior tour was enjoyed by all, seeing that old technology. The FFA President gave us many things to think about and we will see him in the future for a leadership or membership workshop. The Sixth Degree was on a new day and time and it seemed to work better, although we only had three new candidates, we were concerned that the number was to be zero. I thank Flora Debbie Barnes for the Court and the return of the Rose Drill Team with many praises and cheers go to the men and women who marched around the hall, well done. The State President of the FFA Zach Duda talked about the meaning of words to describe action that we take in doing something. He told us that we don’t use the word “SERVE.” We talk about community service, and Grange service, but we don’t use the word serve. In the 1990’s the volunteer fi re departments in the State underwent new state regulations with OSHA, Blood Borne Pathogens and Hazmat. This increased training was met with resistance because of the time needed for extra training to conform with the new requirements. The phrase was “I Volunteer,” meaning I do what I can do and no more. This phrase “I Volunteer” found new meaning, I volunteer to fill the application to join but when I am accepted I accept those requirements I need to better serve my community, fellow members and department. The Grange needs to follow this example, when I join the Grange I will serve the Order, when I become an officer I will serve the best I can. When I volunteer I will serve for the good of the Order. Think about it and have a discussion at your next meeting. It makes sense and it is easy to do. I wish to thank Don Offinger for helping with the Public Relations Committee. He has asked to be released and I have asked Barbara Chapman of Simsbury Grange to fill this position. I have also asked Faith Quinlan of Winchester Grange to fill the vacancy on the Membership Committee. National Grange’s 151st Convention will be in Spokane, Washington November 7-11. It is one day shorter but we have done many things via video conferencing before the convention. The new Pomona Granges will all have had their first meetings and hopefully will have their new bylaws ready for the next meeting. It is important that everyone keeps an open mind as we move forward with these new Pomona Granges. If we fail then there will be no Pomona Granges in Connecticut. I know that we will all set aside the fighting and negative and work together for the good of the Order. Remember, I am here to SERVE. Happy Thanksgiving to all. Noel.